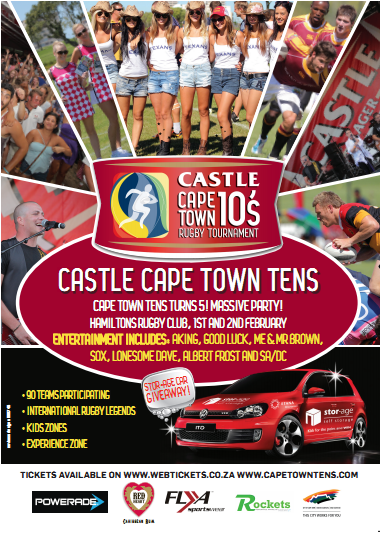 The Cape Town tens has been a staple part of the South African Social sport calendar for 5 years now and as part of the celebration of the fifth year, we are giving away four tickets to Friday and four tickets to Saturday! How old is Cape Town Tens turning this year? Tweet your answer to @TyronBarnard or @ATJabu and include @Tensrugby in your tweet as well as which day you would like to enter for. Competition closes on Tuesday 29 January 2013 at 12:00 and winners will be announced after. If you dont win, still get down, tickets are R70 for adults and R50 for students available from www.webtickets.co.za, kids under 12 free. For more info visit www.capetowntens.com.